Jeffrey Silerio (front) is the model for service. Meet Jeffrey Silerio, CARP Las Vegas Alumni! He joined CARP in Las Vegas in August of 2014 (when it started!) until he graduated from University of Nevada, Las Vegas (UNLV) in December of 2015. Jeffrey is an example how the Principles of CARP motivate him to continue to serve and give back to his community even after graduation. After a clean-up, Jeffrey (left) and Satoshi Inoue (right) take a final photo before Satoshi returns to Japan. While in college, Jeffrey was approached by Satoshi Inoue, a volunteer from Japan, about Shine City Project. 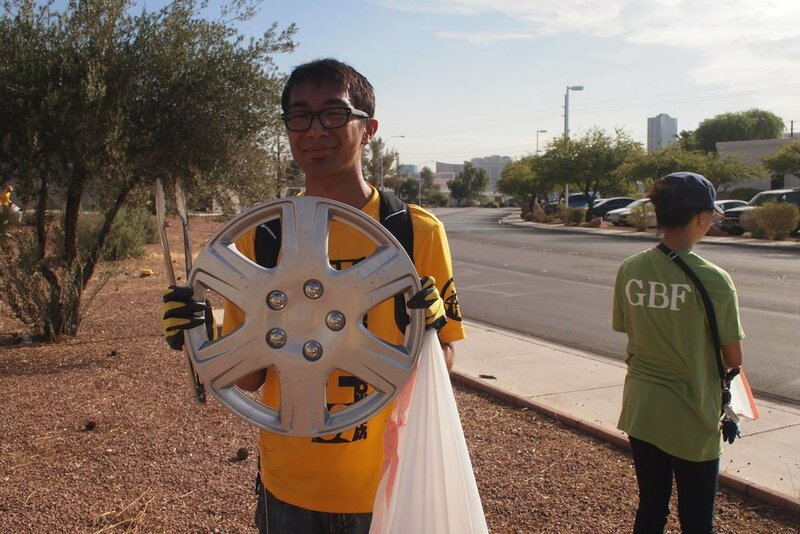 Shine City Project (SCP) is a service organization in Las Vegas aimed at cleaning up Las Vegas and inspiring the community to live for the sake of others. Shine City hopes to change the culture in Las Vegas to be about serving. Jeffrey’s first Shine City Project service project at Lorenzi Park with volunteers. Satoshi stands third from the left. Jeffrey joined his first service project on April 26, 2013. At the time, he had a personal desire to do something for the community and Las Vegas. As someone without an extensive friend group, Jeffrey was also hoping to make friends at Shine City Project. Jeffrey holds the record for attending the most service projects in a row: twice a week for 17 months straight! Shine City Project was a new initiative at the time of Jeffrey’s joining--established in March 2013. While not an initiative of CARP, Shine City also hoped to share Unification Principles through practice and involvement with the community. The first SCP officers with faculty advisor, Tara Pike-Nordstrom. Tara is the UNLV Recycling Manager and Sustainability Coordinator, and she has a loving heart for our Earth and the envirornment. Taken March 14, 2015. After a few months, Jeffrey established Shine City Project as a registered student organization at UNLV and became its first president. Passing out flyers and sharing about Shine City Project at the UNLV Involvment Fair in September 2015 with volunteers and John Everett, a student officer for SCP. Tara Pike-Nordstrom is the Recycling Manager and Sustainability Coordinator at UNLV. While Shine City Project was a registered student organization at UNLV, Tara was their faculty advisor. As graduation fast approached, Jeffrey had to pass on the role of president, but he struggled to find someone with the same commitment to service and Unification Principles as himself. After he left, it seemed that the clean up projects had lost connection to Shine City’s original vision and higher purpose. With the passion declining, the organization itself disappeared. A few years out of college, Jeffrey decided to lead Shine City Project once again, outside of UNLV. Taken October 6, 2018. After months of being inactive, Shine City Project clean-ups were revived with a service project near a local CVS Pharmacy. After its revival in October of 2018, Shine City Project has returned to weekly service projects. A group photo after one of a clean-ups at Jaycee Park in 2016. Jeffrey continues his work with Shine City Project because of CARP’s founders, Rev. Sun Myung Moon and Dr. Hak Ja Han Moon, also known as Father and Mother Moon respectively. Father Moon visited Las Vegas a lot in his final years. His vision was to turn the so-called “Sin City” into a Shining City of God’s love and heart. Jeffrey hopes that Shine City Project can be registered at UNLV again in the future and expand to other cities. This year, he hopes to continue the service projects consistently. In October of 2018, Shine City Project and Generation Peace Academy worked together to help re-vegetate an area of Wetlands Park with some native grass. Projects, so far, include trash clean-ups of public places, planting and gardening, and food distribution. Shine City has done multiple projects in partnership with other service organizations. Shine City Project volunteers at a service project at Wetlands Park earlier in January. Volunteers are welcome to invite and bring their families to experience the joy of service together. An average of 10-15 volunteers come to projects, but Jeffrey has also been part of service projects where he was the only volunteer. Snow doesn’t deter these determined volunteers. Taken at Mount Charleston National Park. Their most recent service project was on January 19th. They traveled to Mount Charleston National Park, 35 miles outside of Las Vegas, to pick up trash. Outside of Shine City Project, Jeffrey does Information Technology for work at Ocean Providence, Outside of Shine City Project, Jeffrey does Information Technology for work at Ocean Providence, providing computer and technology-related assistance for all branches across the country. He also enjoys working a private tutor, helping students from elementary school to college with math and other subjects. From January to May 2018, he completed four months as a missionary in Costa Rica as part of the Generation Peace Academy program. He worked closely with CARP Costa Rica while having a serving and loving heart for the country. Alumni like Jeffrey Silerio show us how to live for the sake of others in a practical way. In his very attitude and action, he shares that loving your city and your community isn’t only words but a way of life. We are proud to call him a CARP alumni and see more greatness in him in the future. For photos, upcoming service projects, and more information about Shine City Project, follow Shine City Project’s Facebook page and website, shinecityproject.org. Hear more from CARP Las Vegas on their Facebook page. Share your story to jennifer@carplife.org!